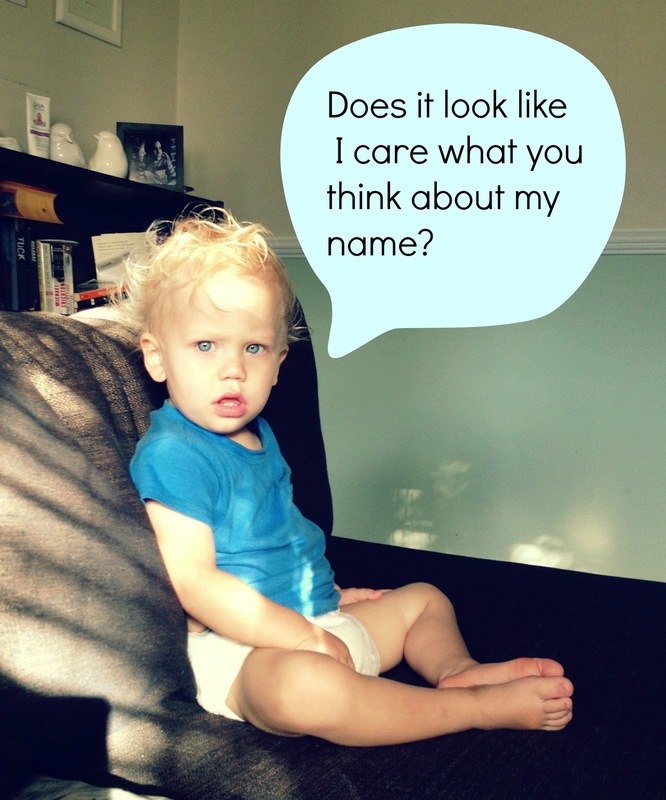 I think that choosing a name for a child is actually a really, really difficult thing to do. We had such a hard time, we ummed and ahhhed over it for almost my entire pregnancy. I had liked the name Ezra from the get go, but it didn't go over so well when we mentioned it to a few people, so it had me second guessing. We didn't officially decide that would be our baby's name until we were in the labour ward at the hospital. Isn't that why most people choose names for their children, because they like it!! I know it is also because it's a family name, or it's sentimental, or it has a great meaning, but it is usually also because they like it. Do people questions parents who name their child David, why they chose that name? Maybe I was just asking for this reaction when I named my child an apparently 'unusual' name. Am I wrong to get irritated when people react this way? I even had one lady at an op-shop tell me it was weird. Thank you 70 year old lady I don't know and don't particularly need the opinion of. To be honest it is mostly the over 50's crowd that are the rudest about it, and mostly complete strangers. They go to lengths to make it sooooo obvious they don't like his name. Most younger folk have grown up with a neighbour called Rainbow, or a cousin called Jorjia (pronounced Georgia) so they don't seem to bat an eyelid and just say 'oh cool'. I remember the kids that got picked on at my school, and they had names like David, Peter and Andrew. Kids at my school maybe made a quick joke or two about someone's unusual name, but that was never the reason for picking on someone. With our very multicultural society Ezra is not really going to stand out in a class scenario. But, Thankyou for your concern strangers in the supermarket! Feel free to vent in the comment section, I know you want to!! 12 comments on "What's in a Name"
I like Ezra, it is such a beautiful classic name...I find it weird that people find it weird. I tell people that it is pretty common in the US, apparently just not here!! Although I did think a lady was yelling at Ezra the other day, turns out her son who was in the process of hugging him was also named Ezra!! Totally agree with you (and your Mom) - if you don't have anything nice to say - just shut up !!! Have a great day with Ezra ! I was always teased growing up with my name but I love it & believe I wear it with pride. We've had quite a few questions about our daughters name, Isla. Yes it is different but different is good! !